In a medium sauce pan brown butter, the chopped onion, the carrot and the celery in little oil, until the onion became golden. Lower the heat and add all the ground meats, stirring constantly. Simmer with red wine until reduced (about 2 minutes) then add tomato sauce, one beef bouillon cube, basil and black pepper. Turn on lowest heat and cover the pan with the lid. Cook for at least one hour and remember to stir very often. If the sauce becomes too thick, add half glass of hot water. Heat the butter until it melts, then add the flour and stir very well until smooth and yellow. Remove from heat and pour in hot milk, whisking continuously until very smooth. Bring to boil, add some nutmeg and stir constantly until lightly thick. Set aside. Grease the bottom of a rectangular baking tray with a knob of butter and spread it with a couple of tablespoons of ragù. Cover the bottom of the tray with a layer of lasagne. 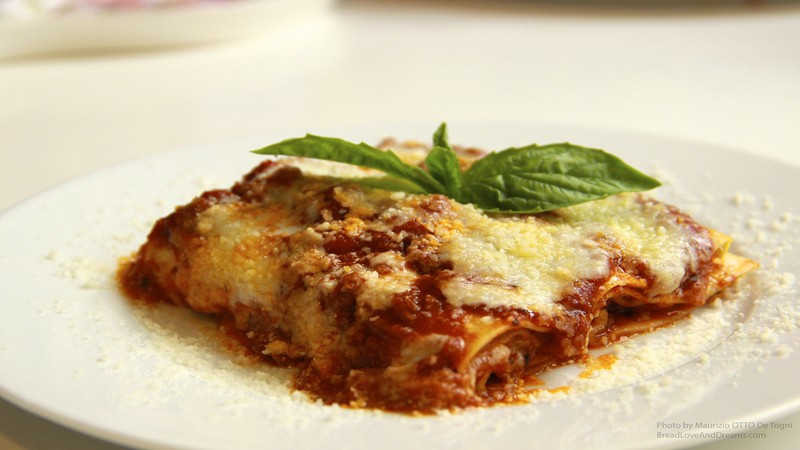 Cover lasagne with ragu’, then with béchamel and sprinkle with some grated Parmigiano Reggiano. Repeat the process (lasagne, ragù, béchamel, parmigiano) until you gets at least four layers of pasta. The top layer should be Béchamel sauce sprinkled with Parmigiano Reggiano. Bake for about 30 minutes, until the edges are browned and the sauces are bubbling. Let cool down for 10 minutes before serving.